Named ‘6d’, our competition entry of a laser-cut plate steel screen performs equally as a bicycle rack or a piece of public art. Based on the binary language of Braille (six dots) its design is abstracted as a reflection on bicycle design and their legibility in our urban streetscapes and traffic culture. 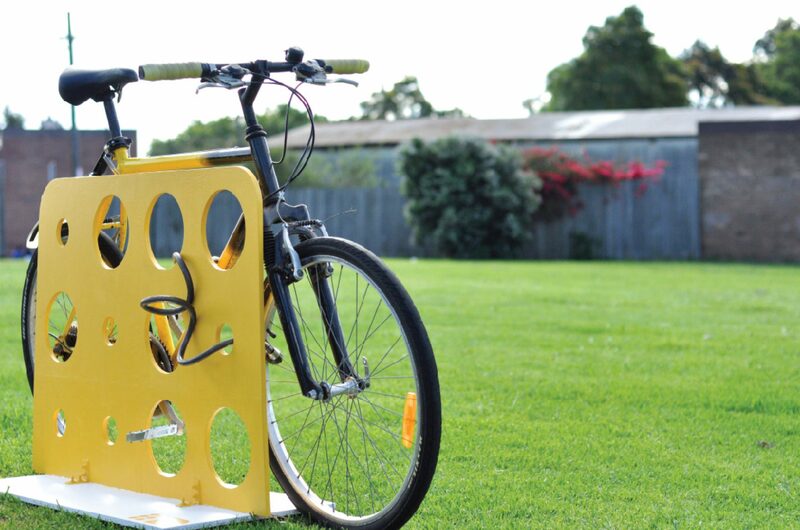 Our freestanding bicycle rack was a competition entry for the ‘Bike Rack as Art’ national design competition held by NSW BikePlan and launched by MAAS and the RTA during the 2010 Sydney Design Festival. The design incorporates place names and other words as motifs, with potential for relevant local words to be used in isolation or in series. This coding concept possesses an innate transferability to other locations and applications because of the aesthetic language adopted from Braille. 6d was designed with an integrated flush mounted solar powered fluorescent strip light in the concrete strip footing forming the base of the rack. This provides uplighting to the rack, allowing visibility for the locking and unlocking of bikes outside of daylight hours and illuminating the rack to provide continuity of its public art function. At 750mm in height, the design suits a variety of sizes and styles of bike and different locking methods. In a two-metre length the design accommodated a minimum of four bikes, and up to 10 bikes in a maximum screen length of five metres.